Hundreds of years ago, our ancestors traveled together in a caravan for safety and survival. Think: The Silk Road and Camels, Oregon trail and Covered Wagons. Today, however, we can travel together in a Caravan for collective and personal expansion. We are excited to introduce Caravan: transformational community-driven experiences that expand your inner + outer world. The Caravan experience is coming to Iran this Spring 2018! Join us for a 10 day all-inclusive unique journey of a lifetime as we caravan through the breathtaking Iran while engaging with each other in an immersive program. We will be curating a small group of purpose-driven global entrepreneurs & creatives to explore Iran and to connect to ourselves. We’ve designed this caravan to highlight the unique place-specific elements of Iran that we believe are the most important for an authentic and meaningful experience. Each day, this exploration will emerge with us engaging in a specific theme that is central to life in Iran (most have no translation in english and can only learned by experiencing). community, public sphere, and local leadership by experiencing the themes of Pir Neshin, Karvansara, and Masjed. You’ll also actively learn about Iran’s heritage of personal and societal intimacy by experiencing themes of Sofrey, Hayat-markazi, 5 Dari and Saqa Khooneh. We believe that at the intersection of immersive deep travel + community + curriculum there is a powerful opportunity for personal & collective growth. In addition to learning about what it means to be Iranian, we will facilitate conversations and interactions around the spectrum of human experience and what it means to be from our respective countries. Imagine after Caravan, you leave with 7000+ years of wisdom and experience. That's exactly our intention. That you won't just end up taking home a gorgeous Persian rug or some incredible mosque selfies. Instead, that you'll expand as a human by gaining access and insight into yourself and into multiple new ways of being - of which you may choose to adopt and take back home with you. That’s what the Caravan experience is all about: coming together to expand our personal, collective & global consciousness. Although we believe the journey is not about the destinations - the ones that we’ll visit are certainly unique and worth mentioning! We will be spending 10 days in between the following cities, towns, & villages. Day 1 & 2: Tehran - Iran’s capital and lively modern metropolis of 12 million people built on the foot of the iconic Alborz mountains and known for its fashion savvy women, skiing, hiking, and diversity of subcultures. Day 3 & 4: Kashan - One of the oldest human settlements in the world (7,000 BCE) this alluring old town is unique for its rose fields, UNESCO gardens, highly atmospheric bazaars, and architecturally significant traditional houses which were built as vacation spots for royalty of the Safavid Dynasty. Day 5 & 6: Maranjab Desert - This desert was once a part of the Silk Road between Persia, Europe and China and is now known for its 230 foot sand dunes, castles, salt lakes, a nightsky full of stars and caravanserais (pitstops for caravans along the Silk Road). After our time in the desert, we will visit Abyaneh, which is a historic red clay village and is like a living architectural and anthropological museum. Day 7 & 8: Isfahan - Known by a famous 16th century rhyme as Esfhan nesf-ejahan ("Esfahan is half the world") this city is brimming with humanity and was once the capital of Persia. Isfahan is home to one of the largest and oldest public squares in the world and many UNESCO mosques that are noted as the best in Islamic and Persian architecture and inlaid mosaic artistry. Day 8 & 9: Shiraz - The Romanticists' city, Shiraz is synonymous with poetry, education, royalty, nightingales, gardens, flowers and picnics. Shiraz is the resting place of Persian Kings and famous 12th century Persian poets including the beloved Sa’di and Hafez. On our way to Shiraz, we'll visit Persepolis ("The City of the Persians") a UNESCO site that was once home to the Persian Empire around 550 BC. Nearly 44% of the human population of the world belonged to the Empire at that time! Day 10: Shiraz & Tehran - Program conclusion in Shiraz then flights back to Tehran! The Iranian spirit is dynamic and deep. The culture is brimming with intellectual and emotional intelligence. A powerful innovative energy pumps through its veins. The opportunity to know and understand this stunning culture is often intercepted by politics and media from the outside, thus leading to the biggest gap imaginable between perception and on-the-ground reality. 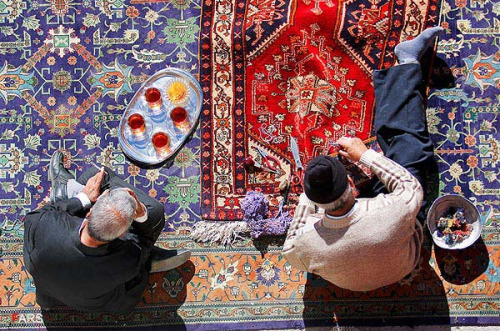 It is for this reason, we are driven to connect those seeking to know and understand the Iranian culture and subcultures from the inside, in a more real and humanistic way. We are all local Iranians and are truly looking forward to share Iran with you! Asya is a social entrepreneur driven to design experiences and products that expand personal, collective and global consciousness. Before founding Caravan, Asya created Reset in Bali, led Hive (a global leadership program) in San Francisco, managed a tech accelerator and filmed a mini-documentary in India, and helped organize a TEDx in Iran. Asya studied at UCLA where she founded and directed innergy the largest wellness & conscious living organization on campus. Shadnaz is an urban thinker and city changer who is deeply interested in how space impacts and interacts with human beings. She is a consultant to UN Habitat’s National Urban Campaign in Tehran and is also author of the book: Innovation and Urban Livability in which she received her Ph.D. Shadnaz is also collaborating on the discursive project Hashti Tehran while serving as the Director of the Environmental Department in Negin Shahr Ayandeh Consulting Engineer Co.
Jamshid will be caravaning with us to document our journey as it unfolds as well as leading us through workshops on how to be better storytellers. He is an Iranian award-winning National Geographic photographer who has been capturing the culture, nature and architecture of Iran for more than 30 years! Mina and Hadi are looking forward to ensuring that we will not just be idle tourists of Iran, but instead, we will be actively engaging & participating in the art, culture, and lifestyle of Iran. Outside of Caravan, they are internationally acclaimed performance artists, filmmakers and creators of Noir Art Group. Arash is the leader of all tour leaders in Iran and is president of the Iran Federation of Tourist Guide Association. Currently he is organizing the world’s first WFTGA conference in Iran! He is well-known cultural heritage researcher and innovator in Iran who knows his land deeply from the inside out and and is excited to join Caravan to share these rich cultural values with all of us!